Gainsborough Trinity suffered another defeat on the road as the conceded five to high flying Darlington. Despite taking the through Nathan Jarman, the Blues conceded twice either side of the half time break. Reid then get Trinity level from the spot before the Quakers grabbed three late goals in a result that was not a true reflection of the game. Gainsborough dominated large periods and the home side looked dishevelled until receiving two penalties in three minutes in the first half, two of four in total. Blues boss Dom Roma made one enforced change to the side that beat Tamworth last time out. Illness got the better of Matt Thornhill so Alex Wiles deputised in the middle of the park. Trinity made a positive start to proceedings with James Reid forcing the Quakers keeper into a stop in the first two minutes with a long range strike. The next ten minutes were all Darlington as they used the width on offer at Heritage Park to get balls into big man Mark Beck. Beck had a deflected strike on target saved and his presence made the defence neglect Liam Hardy at the far post who should have opened the scoring with a far post header. Trinity grabbed the lead on 22 minutes against the run of the play. A long ball up to Jarman fell lovingly into his path and effortlessly fired into the bottom corner to silence the home crowd. The Blues grew into the game and dominated proceedings for the next 15 minutes. Reid had another crack from distance with a free kick which Peter Jameson had to be alert to to turn wide. A dramatic few turned the tide of the game once more. Darlington won two penalties in three minutes, the first for handball. Terry Galbraith fired to Willis’ right and the former Sheffield United keeper did brilliantly to save before reacting quickly to deny the rebound. Trinity elation was short lived though with a shirt pull rewarding the next penalty. The linesman was the only man to see it in the ground, with no appeals from players or fans. Galbraith only just squeezed home the penalty with Willis getting a firm hand on it as the Quakers levelled shortly before the interval. The second half was only 40 seconds old when the home side took the lead. A short corner was hit deep to the far post where centre half Gary Brown nodded in. 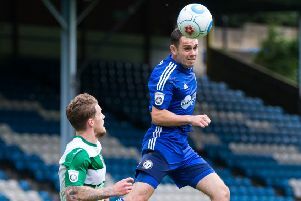 The Blues were determined to get something from their travels and after two handball appeals were turned down, a third appeal was given when Jarman’s cross was blocked. Reid smashed home the spot kick to bring the sides level once more. The equaliser only incited the home side further and the Quakers regained the lead with 20 minutes to go. A deep cross to Beck at the far post was expertly played across goal for sub Nathan Cartman to tap home. Darlington sealed the points shortly after when another sub, David Syers, was brought down in the box and Galbraith grabbed a second from the spot. Syers then put some more gloss on a rather fortunate home victory, when an excellent passing move found him through in goal to grab the fifth. Gainsborough Trinity: Willis, Lacey, Beatson, Sparrow, Evans (Wilson 16), Picton, Reid (Templeton 63), Wiles, Worsfold, Jarman, Thewlis. Subs (not used) Quinn, Roma, Rothery. Darlington 1883: Jameson, Marrs, Watson (Burgess 45), Turnbull, Brown, Galbraith, Thompson, Falkingham (Syers 60), Beck, Hardy (Cartman 56), Gillies. Subs (not used): Bell, Davie.